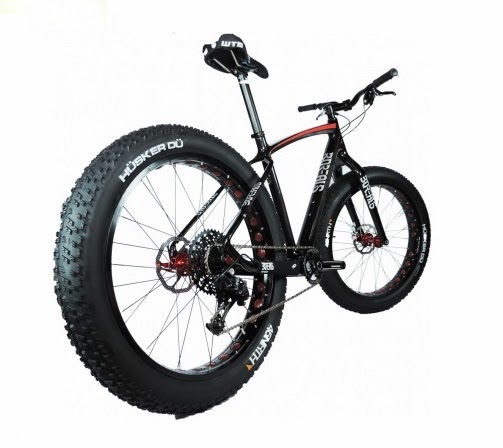 Fatbikes are like unsuspended mountain bikes with enormously wide tires. The bikes look strange, but the large tires provide traction on slippery surfaces and flotation over snow and sand. Fatbiking on snow is a little like snowshoeing, except you need to build a specific skill-set to handle the bike. Proper clothing selection will take some time to dial-in comfort on your wind-chilled feet and hands. After that, the bikes offer exercise and thrills. 1/18/2014, Grand Targhee Snow Bike Race, Alta, Wyoming. 1/25/2014, Abominable Fatbike Race, Como, Colorado. 2/1/2014, Snowy Range Snowbike Challenge, Night ride!, Centennial, Wyoming. 2/8/2014, Tennessee Pass Night Jam, Leadville, Colorado. 3/1/2014, Mineral Belt Mayhem, Leadville, Colorado. 3/22/2014, 28 Below, Black Hills, South Dakota. Several manufacturers are making fatbikes now, including some major players like Trek, Ventana, Salsa, and Yeti. Many smaller builders like Borealis, Schlick, Fatback, and 616 Fabrication also make fatbikes. You can check Fat-Bike.com for news and product reviews. A local Tahoe website is called Sierra Fat Bike. Local dealers rent and sell fatbikes, but most are closed during the winter months. A winter fatbike race or series of races would be perfect during low-snow years because a fatbike race doesn't require snow on the trails. Fat Bike at Lake Tahoe around New Years... from First Tracks Productions on Vimeo.